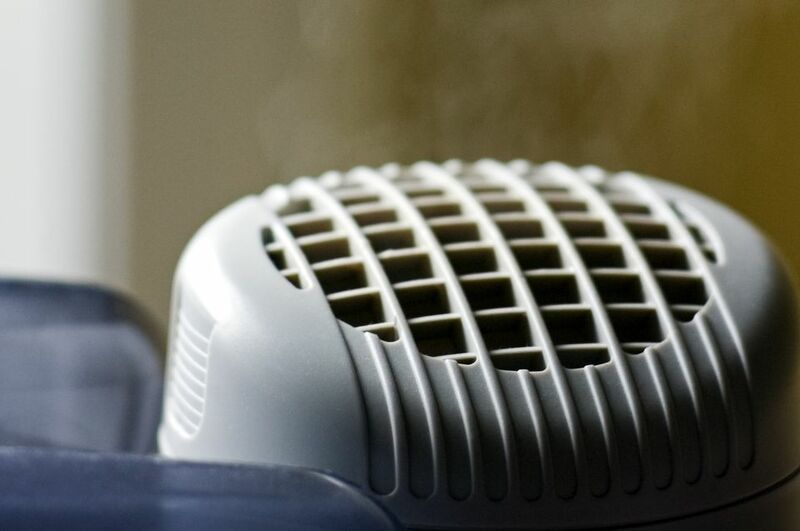 Humidifiers are appliances that add moisture to the air by producing and dispersing water vapor. There are many different types of humidifiers; they may be used in homes, office buildings, or medical settings. Home humidifiers come in several varieties and serve different purposes. Evaporative or cool moisture humidifiers have three parts: a reservoir for cool water, a wick which absorbs water, and a fan. As the water from the reservoir is pulled into the wick it evaporates into the air as vapor. The fan distributes the cool humidity so it can fill the room. Vapor or warm mist humidifiers boil water, creating steam. A fan helps distribute the steam. The advantage of a vapor humidifier is that boiling decreases mold and build-up, and makes it easier to add menthol to the steam. The downside, of course, is that boiling water is expensive to heat and dangerous if spilled. Whole house and room humidifiers. It is possible to purchase and install a humidifier which adds moisture to an entire house. Such systems are expensive but may be appropriate in very dry climates. The vast majority of home humidifiers, however, are portable devices used to humidify a single room. Ultrasonic and impeller-type humidifiers are also available; these tend to be more expensive than other types. Why Might I Want a Humidifier? While all of these issues can be alleviated through the use of a humidifier, it's important to note that too much humidity can also be an issue. Not only can over-humid air create its own health problems, but it can also cause damage to paint, plaster, and wallpaper. In addition, it's important to carefully monitor the condition of the humidifier to avoid mold or other potential allergens. Follow these tips for optimal outcomes. Q: Which type of humidifier is safer: cool mist or warm mist? A: Cool mist is safer if you have concerns about keeping boiling water in a particular room; warm mist is safer if you are more concerned about possible mold or mildew in your humidifier. A: Never add salt to any type of humidifier. If can destroy any metal components reducing your humidifier's lifespan, clog your filter and hinder proper operation. A: You may have a type of humidifier that produces an invisible mist. If the unit is operating and the water level is dropping as it should, the unit is taking in the air and returning an invisible mist back into the room. Your operating manual should also be able to confirm this type of operation. A: The choice will depend on who is in your household and what you need in a humidifier. In general, it's best to avoid warm mist humidifiers in households with small children or active pets who could knock over the humidifier and be injured. Warm mist, however, might be a good option for an older adult who wants to cut down on maintenance. A: For an average size bedroom, a 700 - 900 sq ft capacity would be sufficient. Q: How long will a 2 or 3-gallon humidifier run before refilling? A: Usually 11-16 hours depending on whether the machine is turned to maximum or minimum power. A good rule of thumb is just to fill it every night or morning to ensure continuous operation. What Is the Best Way to Keep Your Mop Sanitary?